We all have our own personal relationship with food. Some of us eat to live, others live to eat. Whichever side you fall on, there’s no denying the power of food to tell a story. It can take you back in time to your childhood, or on a journey to a place you’ve never been. 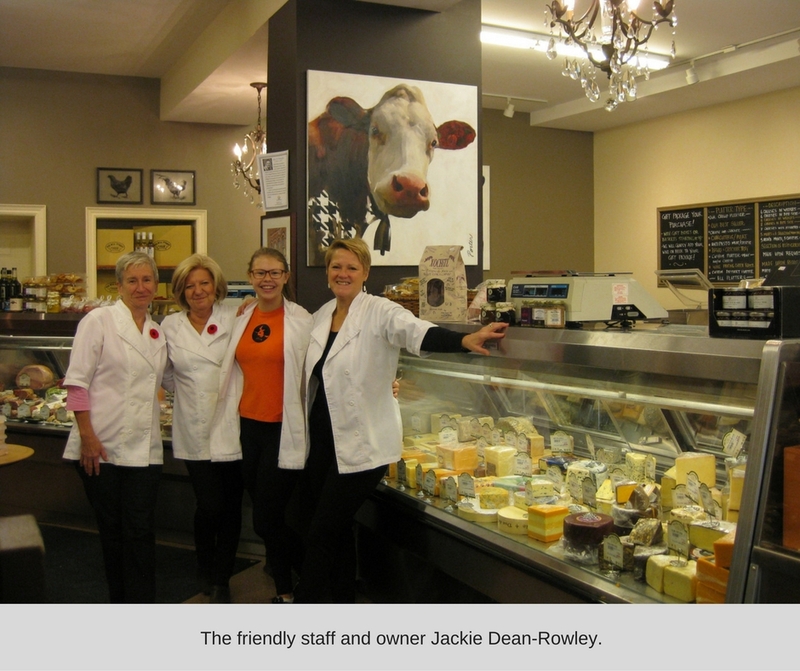 The folks at Mill Street Cheese Market know this and have created a place where people can rediscover the joys of food. Located at 96 Mill Street, the building was previously a butcher shop for 110 years. Owner Jackie Dean-Rowley is one of those people who live to eat; shopping for food is a favorite pastime of hers and a source of inspiration. Her love of the retail experience combined with a passion for cheese is what inspired her to open a shop in Georgetown. To her cheese is the most expressive food, because even though it has four basic ingredients, there are so many varieties. It’s that beautiful simplicity that makes cheese something special she wants to share. 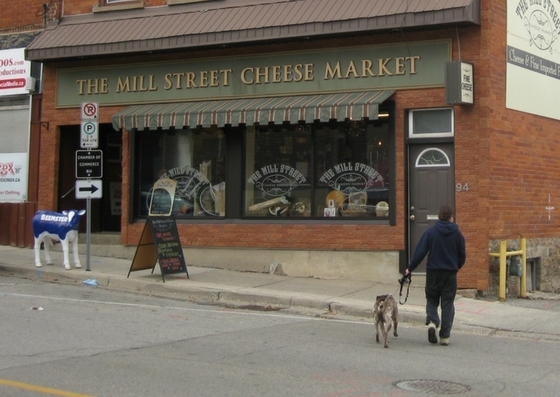 Located west of Toronto in the heart of Georgetown is where you’ll find the Mill Street Cheese Market, its redbrick exterior is a reminder of simpler days when shop owners got to know their customers. Inside the marble counters and chandeliers create a bright and modern atmosphere, while cow figurines and paintings add a nice personal touch of warmth and humour. A view from the front of the shop shows off all their lovely offerings. The shop may be small, but it’s filled with flavours from the Niagara region, Canada and Europe. 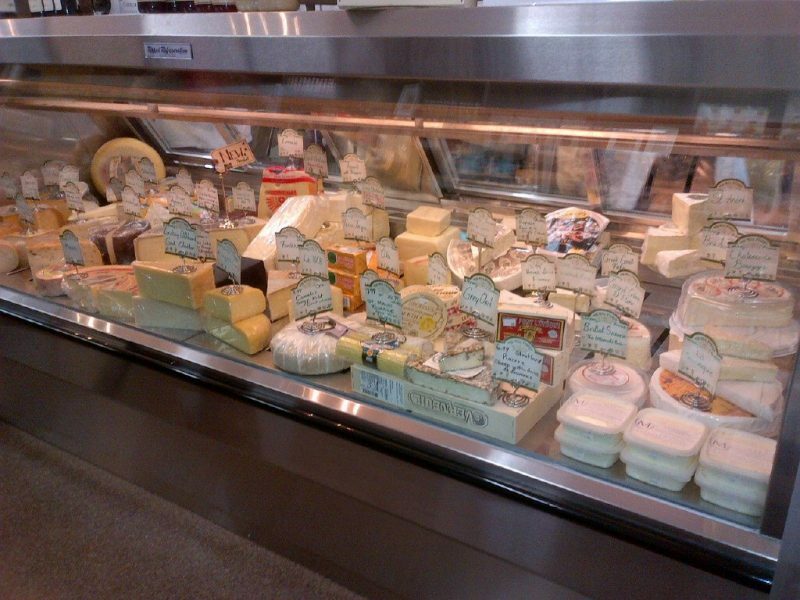 Their cheese case features over 60 different varieties and the selection is always changing. At the back of the store is a counter showcasing cured meats from local producers, as well as the best cuts from Quebec, Italy and France. All the items in the shop have been personally tried and tested by Jackie who makes sure they only stock the best of the best. That’s why you’ll only find one brand of certain items, such as Fred’s Bread from Toronto, St. Viateur Bagels from Montreal, and the San Marzano variety of tomato. Their shelves are lined with dried goods, preserves, jellies, and crackers to help you create the finest cheese boards. They’ve even organized these items by the type of cheese they pair well with. The display case is full of delicious cheese from all over the world. While they stock cheese from all over the world, what’s really impressive is their selection from different Canadian provinces. From Manitoba they included Bothwell Cheese for its award-winning cheddar varieties. A recommended pairing would be the Red Wine Extra Old Cheddar with Ploughmans Chutney made from apples and onions to add a tangy sweetness. One of their most popular cheeses to try is the Chevre Citron, described as a happy accident created at the shop. It’s a soft goat cheese with a hint of citrus that’s offered three ways as a cheese ball, cheese log, and dip. 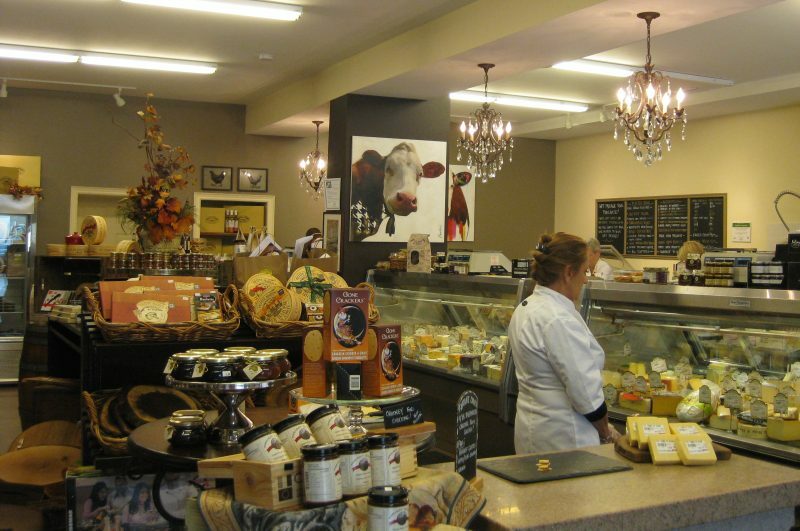 For those feeling adventurous you can try the Grey Owl Cheese by Fromagerie Le Detour in Notre-Dame-du-Lac, Quebec. It’s a surface-ripened goat’s milk cheese with an edible dark rind of vegetal ash, creating a tangy flavour that contrasts beautifully with the sweet flavour of the cheese. 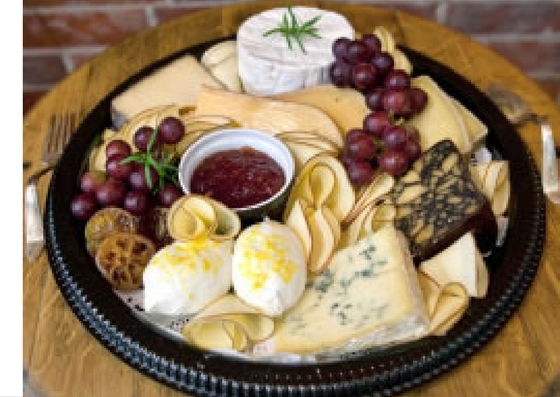 One of Mill Street’s best -selling platters. For the cheese fanatics they can get their regular fix delivered to their door by subscribing to the Cheese of the Month Club. 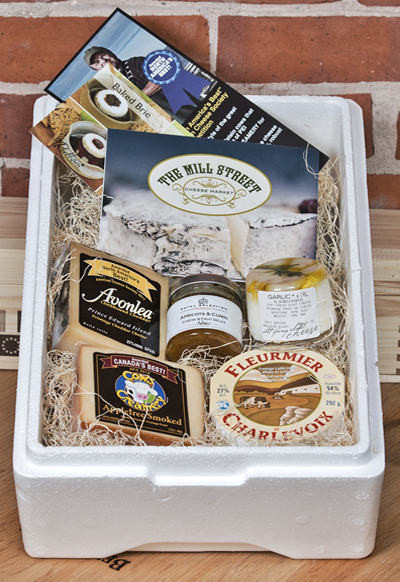 Each box contains a selection of cheeses along with crackers and preserves to pair them with. There’s also a version that includes a meat pairing. Putting together these monthly boxes is treated like an art form. A lot of care and thought is put into making every month an adventure. They look at what’s popular with the regulars. They experiment with pairing flavoured crackers and chutneys with different cheeses. The goal is to create the reaction of someone who has stumbled across buried treasure when they open the box. This is what you might expect if you join Mill Street’s Cheese of The Month Club. While you can get their cheeses delivered to your door, a visit to the Mill Street Cheese Market is worth the trip. There’s never a shortage of friendly staff to help you out and everyone at the shop has a food background so you’re guaranteed to leave with a few new words to impress your foodie friends. If you can, visit on a Saturday as they usually have someone sampling their unique cheeses with pairings. It’s a true haven not only for cheese lovers, but anyone who lives to eat.